Grambling women add four to 2018 class, getting height and skill. GRAMBLING, La. 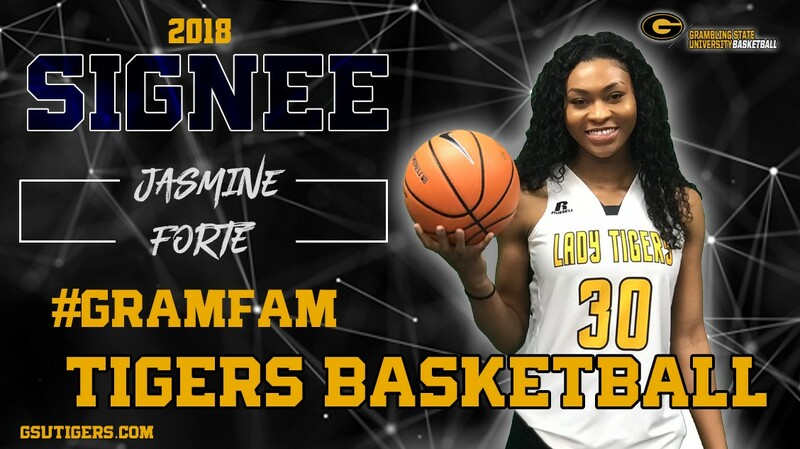 | Grambling State University head women’s basketball coach Freddie Murray and the Lady Tigers announced the addition of Jasmine Forte and Camryn London to the upcoming class. Forte, a 6-foot-3 center from Woodbridge High School in Woodbridge, Va., averaged 6.1 points, 7.2 boards and 2.8 blocks after missing over half her senior year coming back from an injury. London, a 5-8 combo guard from Shaves Valley High School in Birmingham Ala., completed one year at The University of South Alabama before transferring to Jones County College in Ellisville, Miss. While at Jones CC, London started 13 games, while averaging 7.9 points, 3.0 rebounds and 1.3 assist per contest. She shot 48.4 percent from the field, 30.0 percent from beyond the 3-point line and 73.5 from the free-throw line. Forte and London join Mylashia Yancey and Madison Connally-Banks as the players Murray has added in this year’s incoming class. Grambling State went 19-14 last season and captured the Southwestern Athletic Conference (SWAC) Women’s Basketball Tournament Championship by defeating rival Southern in the title game. It was the Lady Tigers’ first tournament crown in nearly 20 years. GSU advanced to the NCAA Division I Women’s Tournament and fell in the opening round to second-seeded Baylor.